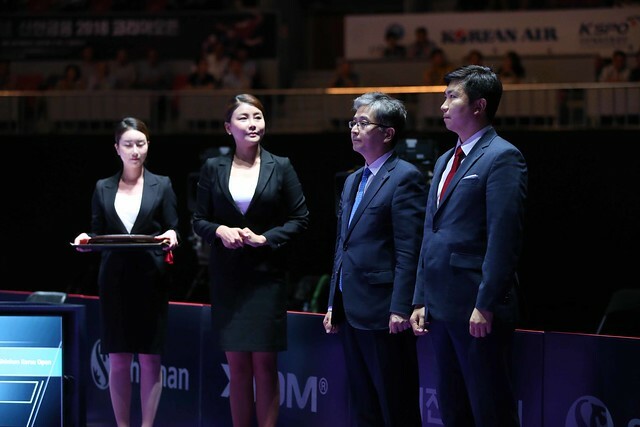 Currently listed at the top of the world rankings, Zhu Yuling justified that status in the final of the Women’s Singles event at the Seamaster 2018 ITTF World Tour Platinum Shinhan Korea Open in Daejeon on Sunday 22nd July. The no.2 seed, the order being based on the June listings, she beat colleague Chen Meng, the top seed, in five games (11-4, 8-11, 11-8, 11-5, 11-9) to arrest to title. Quick to attack, the first to seize the initiative, Zhu Yuling established a 4-2 lead in the opening game; she never looked back, she surrendered just two more points. The initial advantage to Zhu Yuling, the second game was to some extent a reversal of the first; determined to stay close the table, Chen Meng won the first three points of the second game. It was a lead she never relinquished. In the third game just as in the second, Chen Meng secured the initial three points, only on this occasion with the rallies at breakneck speed, Zhu Yuling responded, she levelled at 4-all, established a 9-5 lead, prior to securing the game and re-asserting her overall lead. Counter attacking skills at the highest level, the balance demonstrated by both players outstanding, Zhu Yuling established a 5-1 lead in the fourth game, the speed and consistency of her play forced errors from Chen Meng. Notably both players on occasions opted to serve with the forehand from the centre of the table to cover the angles the opponent may gain. The advantage was maintained, Zhu Yuling held a two games lead. Once again as in the second and third games, in the fifth game, Cheng Meng secured the first three points but as in the third, Zhu Yuling responded. She levelled at 4-all: then she won the next point. Chen Meng called “Time Out”, she won the next two points but was never able to build on the advantage. Always the favourite in the rallies, the slightly faster player, at 10-9 Zhu Yuling held match point, the opportunity was seized. It was for Zhu Yuling her fifth career ITTF World Tour Women’s Singles title in nine finals, for Chen Meng her third runners up spot in 11 finals.